As autonomous driving sweeps the industry, it seems the goal is for the human brain to do less work behind the wheel. 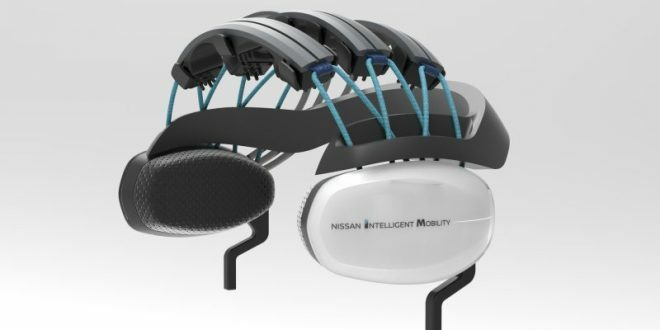 Well, apparently Nissan is thinking otherwise as the company has shown off its new brain-to-vehicle (B2V) technology that uses brainwaves to control vehicles. This Jetson’s style technology leverages a specific headset on the driver that tracks certain happenings in parts of the driver’s brain. This feed is provided to the vehicle, which has algorithms to understand what is going on in the driver’s brain to asset in the prediction and anticipation of their next moves (such as changing lanes). The system can also determine what the driver needs to be comfortable, such as cooler temperature setting. Nissan is being vague about details of the B2V system so far, other than calling it a component of their Intelligent Mobility strategy. It is often debated if autonomous vehicles will ever be able to fully replace the human brand behind the wheel. This approach from Nissan appears to be an attempt to bridge the gap between machine learning and the human mind. But who wants to weird a whacky headset in the car? Nissan will reveal the B2V system has part of a broader Intelligent Mobility announcement at Consumer Electronics Show this month.